Drop script into your Scripts folder. Assign objects you wish to be exported together as one file to a new layer in the Layer Manager. Name the layer according to what you would like the exported file name to be. Each layer with its assigned contents will be exported as its own file based on the format of your choosing and named according to its layer name. 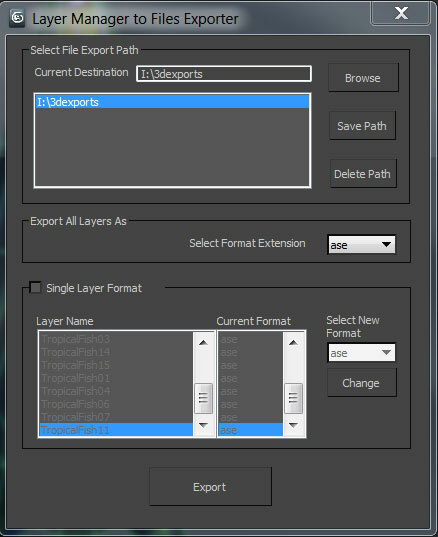 So if you have 10 layers in the Layer Manager you will get ten exported files. Anything assigned to Default Layer 0 will not be exported. Use Default Layer 0 for anything you don't want to export out such as reference planes. After layers are created simply run the script, select your format and target destination, and then click the export button. Delayed bug fixes. No new features until version 3. -layer list doesn't update automatically. You will need to restart the script each time you add a new layer into the layer manager. - Dragging script into the viewport will result in script breaking. Script must be executed by maxscript-> RUN. Added ability to save and delete destination locations. Added ability to set export format on a per layer basis. Version1- cleaner interface with ability to select destination path. Submitted by 3di on Fri, 2018-01-26 06:36. Can you make this so that it can automatically divide a large max file into a user defined number of max files. For example if there are 1000 objects in the scene, I'd select break into 5, and then each resulting new max file would contain 200 objects, and each file would have the original layer hierarchy. Submitted by dmitrybelonosov on Sat, 2017-09-16 12:19. Thank you very much! That's what I was looking for! Submitted by wiesner on Fri, 2015-10-16 07:00. If you are still having issues, can you pleas post screen grabs of the errors? I cannot reproduce in max 2014. Submitted by wiesner on Thu, 2015-10-15 07:55. Sorry for the extremely late reply. The crash is most likely occurring due to maxscript changes for the 2013 which affects the script. This script was made in max 2012 so definitely outdated for recent versions of max. I will re-look into the script when I can and see if I can reproduce the issue in my max 2014 version. Submitted by Sajmo on Sat, 2014-11-29 17:47. I'm trying to use the script on 3d max 2013 and it works until I change the exporting file type. It worked with the initial file extension bun when I select a different file extension it gives me an error opens a word pad with the script's codes and it doesn't respond to no other command. Submitted by Sajmo on Sat, 2014-11-29 17:40. I'm trying to use it with 3d max 2013 and it works untill I want to change exporting file type. When I select a file extensin different from the initial one the script crashes an doesn't respond to any command. Does anyone have any idea what happens and how can I fix this prob. Submitted by wiesner on Mon, 2013-01-21 08:44. Due to my busy schedule I will be unable to keep this script updated. Submitted by wiesner on Mon, 2012-02-06 08:45. Thanks again for testing it for me. I'll be sure to put a canceling fix as top priority before I work on the additional layer controls I wish to implement. Layer disable controls or adding selected layers is something I had planed for the next version along with a few smaller items. Submitted by crystal3d on Mon, 2012-02-06 03:16.
i forgot to choose "max "format and it tried to export in "ase" and "ase" format asked me the export options in a separate window.Then i tried to "cancel" yet it exported somefiles... so once you hit export , it will eventually export no matterwhat... not a big deal. here are my suggestions if i may..? * it does not remember the last selected format. Maybe if you can put "none" option in to the "select new format" section. so those layers dont get exported. Submitted by wiesner on Mon, 2012-01-16 08:22. That is a good idea. I will add that to the next version I have planned to release in the near future. Thanks!